Both Grandmas (Nana and Dassa) have been here helping out - cooking, cleaning, and loving Cadie. 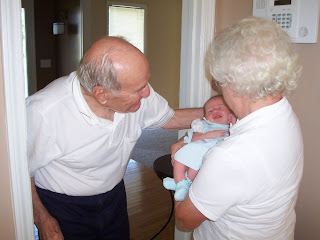 My Nana and Dado, Cadence's other great grandparents on my side were here on Tuesday. 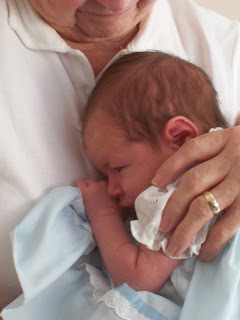 This was sweet, Cadence cuddles with Nana. 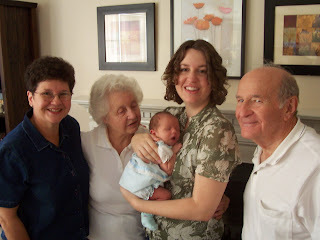 Another four generation photo op. In this picture, Cadence is wearing a dress I wore as a newborn! 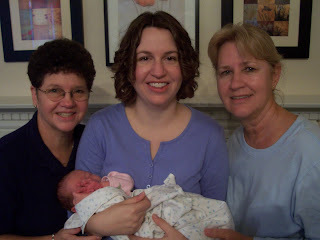 Cadence is blessed with two very special grandmothers, Nana and Dassa. She is also blessed with very special greatgrandparents, Grand Nana and Grand Dado. It will be exciting to see pictures of Cadence with other family members as they make arrangements to visit her.